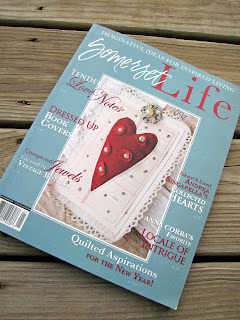 not only is it filled with beautiful color photos, inspirational ideas, wonderful ways to bring beauty to your life, but it has an article written by Alice W at Romantic Thoughts about how a little doll brought kindred spirits together... hers and mine. It was a lovely story about how a doll that Alice W had found, which was very similiar to a doll my Grandma Jones had before she died. That doll had been waiting for a crochet dress that my grandma was going to make. Unfortunately, when she died none of girls kept that doll and Alice lovingly gifted me with her doll. Now everytime I walk by that doll, I am not only reminded of my loving Grandma but of a lovely lady that brought so much joy to my life. I felt so much like God had guided my to Alice W through her blog. Thank you Alice for your generosity and your Christian spirit. You have so blessed my life. So all of you out there in the blog community, I encourage you to leave messages and connect with other kindred spirits. If you don't have a blog, I encourage you to just do it and connect with other people. If you want to read more about our story and to just be inspired get your copy of this wonderful Somerset Magazine. Ordered my copy online...trying to be patient waiting for it to arrive! Wow. What a neat story! Aww Sheila...I am so glad you were able to get a copy and read it! Thanks again for letting me share that with the world...I am blessed to have had the chance to connect with you through that...it will be a fond memory cherished for a lifetime! That is so cool! You should frame it! We didn't get the issue yet here in Canada. I am waiting on pins and needles cause I was told my work is in there. I read the story a few days ago! What a wonderful world blogland is!